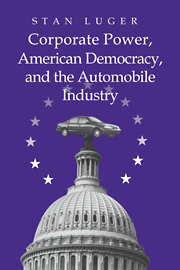 This book offers a critical history of government policy toward the U.S. automobile industry in order to assess the impact of the large corporation on American democracy. Drawing together the main policy issues affecting the automobile industry over the past forty years--occupant safety, emissions, fuel economy and trade--the work examines how the industry established its hegemony over the public perception of vehicle safety to inhibit federal regulation, and the battle for federal regulation that succeeded in toppling this hegemony in 1966; the subsequent efforts to include pollution emissions and fuel economy under federal mandates in the 1970s; the industry's resurgence of influence in the 1980s; and the mixed pattern of influence in the 1990s. Acknowledgments; Introduction; 1. Studying power in America; 2. The structure of the auto industry; 3. Corporate political hegemony and its decline: 1916–66; 4. The politics of compromise: 1967–78; 5. The resurgence of corporate power: 1979–81; 6. The triumph of corporate power: regulatory policy, 1981–8; 7. The triumph of corporate power: trade policy, 1981–5; 8. Interregnum: 1989–96; Conclusion: corporate power and American democracy; Index. "A calm, analytic, probing, documented and riveting critique of Washington's kowtowing to Detroit, and the efforts of consumer and environmental groups, on behalf of motorists, safety and clean air, to stop the melding of this corporate state." Ralph Nader, Washington D.C.
"...a scholarly study of the history of the power and influence of the automobile industry on governmental policies and the interactions of government, automobile industry, and societal pressures...the author does a creditable job of presenting the material. For readers interested in policymaking with respect to the automobile industry, it is a jolly good read." The Flying Lady, Rolls-Royce Owners' Club.